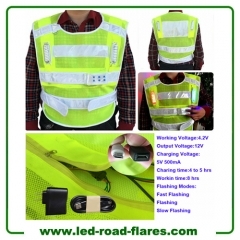 1.China LED Safety Vest, LED Safety Vest Manufacturers, Supplier and Factory. 2.China LED Safety Jacket, LED Safety Jacket Manufacturers, Supplier and Factory. Hi Vis Reflective Rechargeable LED Safety Jacket is Perfect accessory for boaters or hikers in a search and rescue situation.The ultimate in making individuals visible in dangerous high-traffic or low-light surroundings. 4. Excellent for Cyclists, runners or general safety. 5. The effective visibility range in good conditions is up to 80-120 metres, The leds can be seen from up to 300 metres. When you charge it 4 to 5 hours will enable the LED's to operate consistently for up to 8-10 hours!